Anytime I see a photo or story about the 1964 New York World's Fair, I immediately think of the scene at the end of the first "Men in Black" movie when Agents K and J face off with the alien invader who has come to Earth in search of "The Galaxy." This story from an April 1964 issue of Electronics magazine reports on preparations made for the grand opening on April 22 of that year. Based on the typical three to six month lead time for publishing magazines back in the day, this material would have been gathered long ahead of time. Of course now that half a century has passed we hardly consider any of the whiz-band technology presented there as being anything wonderful, but then half a century from now our grandkids will laugh at what we consider amazing at the present time. Here is an interesting statement from the article that really gives you an idea of generational progress: "The World's Fair alone will contain some 300 television sets, almost twice as many as existed in the whole country when the 1939 New York World's Fair opened." 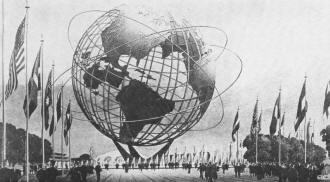 Twelve stories high, the stainless-steel Unisphere at the center, of the fairground will remain after the fair. Electronics puts words in Lincoln's mouth, designs buildings and choreographs dancing waters at the New York World's Fair opening April 22. In the 25 years since President Roosevelt opened the last New York World's Fair, life has become increasingly dependent on electronics. So has the art of producing a world's fair. Without electronics the fair would have been possible, but much less an expression of our time. 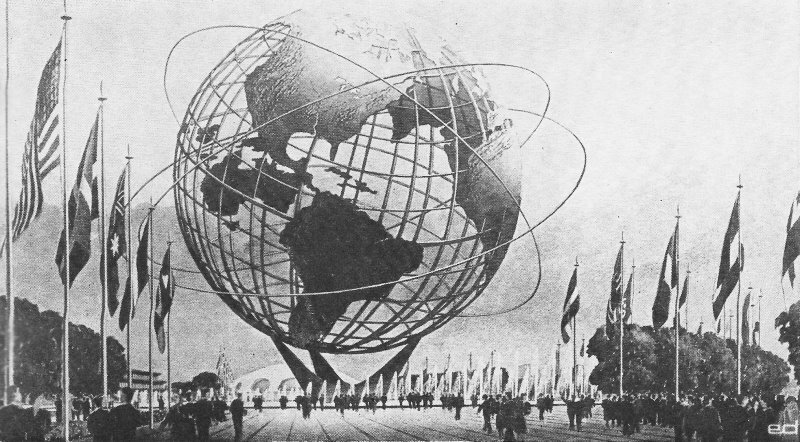 Even before shovels began to dig into the ground at Flushing Meadow, the fair's official symbol and focal point, the United States Steel Co.'s Unisphere, was being designed by a computer. Without the help of the IBM 704, a U. S. Steel engineer says, the project "would have taken us something like 10 years." Resembling a huge Easter egg, the IBM ovoid contains a 500-seat theater. 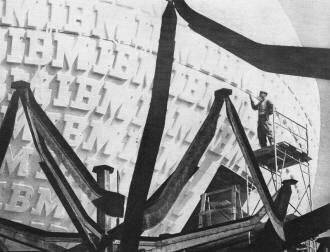 The structure carries the letters IBM almost 1,000 times." 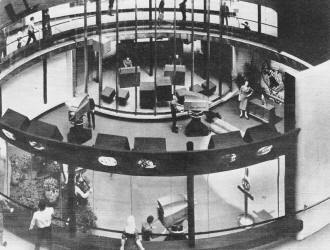 Color tv studio in the RCA building will enable visitors to watch a shown in production from galleries and on monitors. Five-Thousand-Year Capsule: Westinghouse will sink this stainless-steel capsule, filled with evidences of the state of our civilization, for retrieval in the year 6965. Detailed directions are being deposited in remote monasteries. About 670 simultaneous equations had to be solved to design this 120-foot sphere. Its 940,000 pounds of stainless steel form a structure that is mathematically indeterminate to over 1,000 degrees. The solution was done in matrix form in several trials. Another computer-planned exhibit is the General Electric Co. building. A GE 225 computer with critical-path-method programming helped to plan the construction of the complex pavilion. A 90-foot white egg also was hatched with the help of a computer. Floating over a forest of red steel trees at the International Business Machines pavilion, the egg - IBM prefers to call it an ovoid - contains a multiscreen theater dedicated to explaining computers and their operations. The audience will be whisked up into the egg by a moving bleacher-like structure called a People-Wall. Inside the egg and in the steel forest below, little theaters and corridors will contain more exhibits about data processing. In addition to their role behind the scenes, computers will be performers at the fair. In IBM's red forest, visitors will be able to write down any date in the last century, and an IBM 1460 will read the date through a pattern-recognition device and print out the major event of that day. Another IBM machine will translate Russian into English. Animated exhibits will explain other facets of data processing. Elsewhere at the fair, a variety of electronic brains stand ready to serve in both familiar and strange ways. A Univac 490 at the Federal pavilion will give forth, on demand, bibliographies on a variety of subjects, and essays in four languages as part of the Library U.S.A. exhibit. An electronic coiffure consultant at the Clairol pavilion will advise girls on how to deceive everybody except their hairdressers. An NCR 315 computer at the National Cash Register pavilion will show its versatility by answering questions about both recipes and science. In the Parker Pen building, an IBM 1440 will act as a matchmaker to find pen-pals anywhere in the world. It will match data about prospective correspondents on a wide variety of interests and languages, including Swahili and Esperanto. In an obvious attempt to replace people with something more durable, several exhibits are featuring animated figures that talk, sing, dance and make faces. 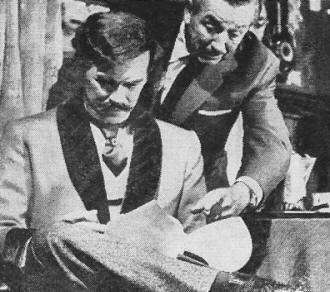 About 460 Audio-Animatronic figures for four pavilions were produced by Walt Disney's Imagineers. One Disney figure, Grandma, is already something of a celebrity. She has been passed off as a real person on a first-class transcontinental flight and checked in and out of the Presidential Suite at the Americana Hotel in New York, both without major incident. 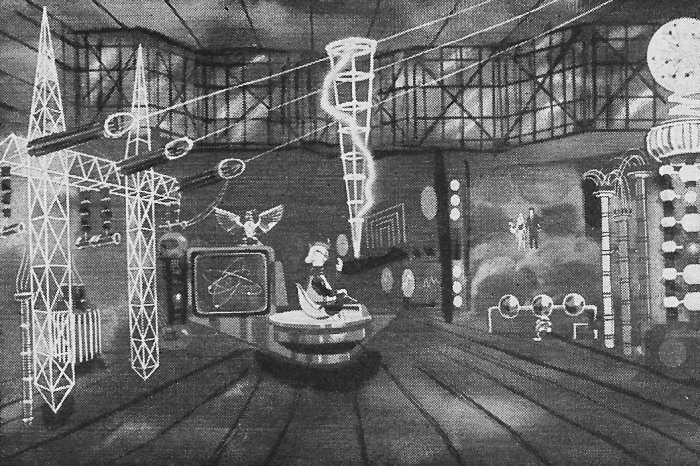 Starting April 22 she'll work at the GE exhibit, joining other animated figures in telling the story of progress through electricity. An animated Abraham Lincoln in the Illinois pavilion will resemble the 16th president down to the smallest detail and mannerism. Lincoln will be programed for 47 complex body motions and 17 facial expressions. He will clear his throat, twitch one eyebrow at a time, and deliver patriotic speeches with lavish choral accompaniment and lighting effects. Though the figure will be operated by hydraulic, pneumatic and mechanical means, his actions will be programed on a 32-channel magnetic tape one inch wide, carrying speech and music tracks as well as sonic and ultrasonic pulses that control up to 438 separate actions. Besides determining Lincoln's actions, the tape will control stage and theater lighting, sound effects and the stage curtain. Uncle Ben, principal in a cast of mixed-up characters in the Electric Power and Light exhibit. In the Ford Motor Co. pavilion, Disney animations will depict cavemen and a family of fighting pre-historic monsters. The Pepsi-Cola show will include a salute to Unicef - the United Nations International Children's Emergency Fund - by Disney figures of singing and dancing children from several countries. 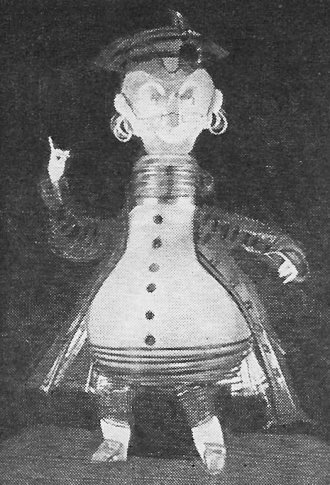 A show on advanced power sources will be given at the Electric Power and Light exhibit by an animated light bulb that resembles Benjamin Franklin. He will be host at an uninhibited show about fuel cells, thermoelectricity, thermionics and magnetohydrodynamics. Incidentally, this pavilion should be easy to find at night because its 12-billion-candlepower tower of light may be visible as far off as Washington. The Power and Light exhibit also will feature a research scientist's nightmare - a Rube Goldbergian laboratory that somehow manages to demonstrate, amid smoke and flashes, some solid truths about electricity. In a farm scene at the same pavilion, an electronically controlled cow will sing out, in a rich bovine contralto, her satisfaction at being milked by a snuggly electric milker rather than by Farmer Brown's cold clammy hands. And a duet of pigs, the Happy Hams, assert that "electric thingamajigs make for premium pigs." An animated figure of Sherlock Holmes in caricature will be one of the animations at the IBM pavilion. To the amazement of Dr. Watson. Holmes will use digital logic to solve "The Case of the Elusive Train, or "The Plurality of the Singular Green Moustache," in which a switchman's green mustache provides the key clue to finding a stolen Glasgow Express. In contrast to the activities of the hundreds of animated figures, real people will have to put forth a minimum of energy at the fair. At many of the larger pavilions, visitors will ride through the exhibits in a variety of ways. The Bell System will provide moving contour chairs equipped with binaural sound systems. Electric Power and Light exhibit, will present a show on the uses of electricity and new power sources. A totally uninhibited laboratory is one of his settings. 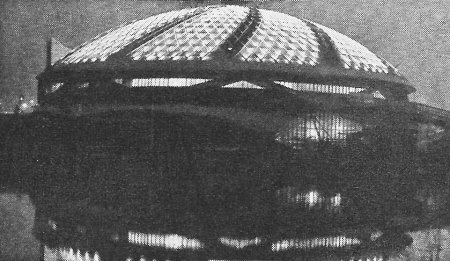 GE Progressland pavilion's 200·foot dome, lit at night by multicolored lights that make it appear to turn, contains a planetarium-like show and a controlled nuclear-fusion experiment. 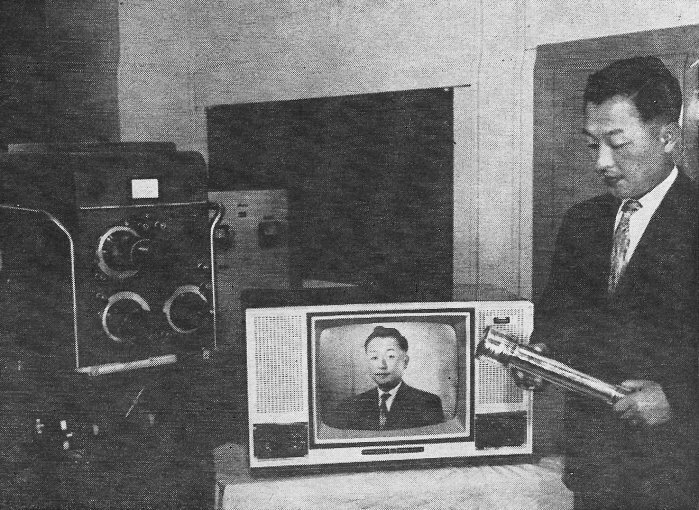 Japanese storage-tube camera: One of many industrial and consumer items to be shown in Japan's exhibit, a Toshiba storage tube, held by an engineer, can remember an image and deliver it to a tv monitor minutes later. It was made by the Tokyo Shibaura Electric Co. Briefing from the master: electronically programed animated figure, a narrator in GE Progressland story of electricity, gets final instructions from Walt Disney. A giant in the streets of Colonial America, a Disney technician puts finishing touches on animated display scene for the Ford pavilion. Ford's visitors will ride in new convertibles through animated worlds representing the remote past and the distant future. At the General Motors Futurama, visitors will travel to the moon in groups of bucket seats, and ride past displays depicting an Arctic weather station, an electronically controlled desert farm, an undersea resort and a jungle city. Each group of seats will have an optical-film recording sound unit, triggered along the route for synchronization. Other rides include a monorail train, a Swiss skyride gondola over the fairground, and a mammoth ferris wheel that looks like a Royal tire. The World's Fair alone will contain some 300 television sets, almost twice as many as existed in the whole country when the 1939 New York World's Fair opened. This network of color TV monitors throughout the fair will serve, among other things, to reunite children with their parents. 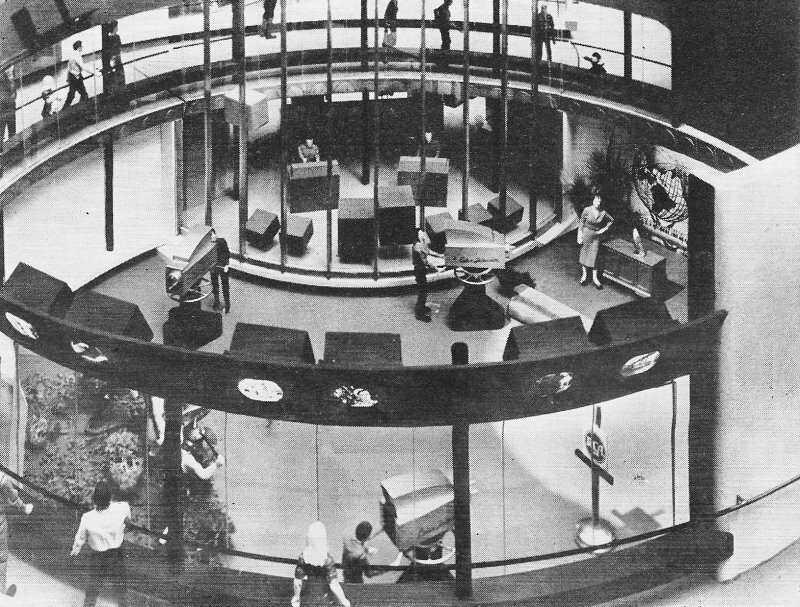 Color television programs will originate in the Radio Corp. of America building, which features a complete color TV studio built so that visitors can watch all phases of show production from walk-around galleries. RCA is planning audience participation shows, news telecasts, see-yourself-on-color TV demonstrations and listening rooms for stereo and hi-fi music. Telecasts originating at the fair will be relayed to Manhattan from the Bell System pavilion by a horn antenna atop a 130-foot tower. The control room at its base will be clearly visible. The rest of the Bell System pavilion will tell the story of communications. Exhibits will explain the operation of the eye, ear and throat, crystals and solid-state components. A torsional-wave machine will be shown, and another exhibit will make speech visible. The public will be invited to tryout the new Picturephone television-telephone, which Bell is getting ready to market. A visitor will also be able to engage an electronic adversary in a game of wits at tic-tac-toe. Radio hams will head for the Coca-Cola pavilion, where a fully equipped amateur station with three operating positions will be available for licensed operators and for kibitzers. Station K2US, built by the Hallicrafters Corp., is sponsored by the American Radio Relay League. Coca Cola also has the world's largest electric carillon on a 120-foot tower. Turned up to full volume of 3,600 watts of acoustic power, its rock-and-roll or symphonies would be easily heard in Times Square, 15 miles away. 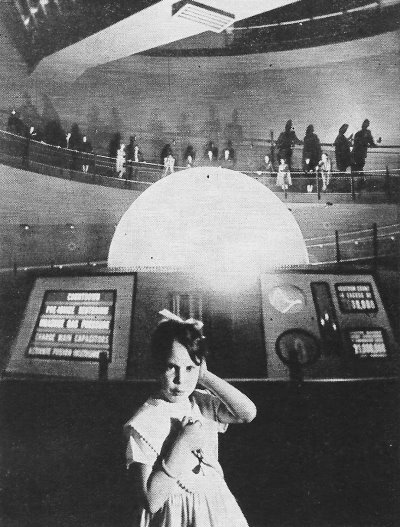 The basic science exhibits range from "Atomsville, U.S.A.", a children-sized nuclear-science exhibit by the Atomic Energy Commission in the Hall of Science, to a controlled nuclear-fusion experiment performed in the white dome of the GE pavilion. 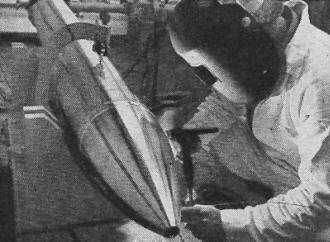 At GE, with space-age sound effects, gongs, flashing lights and a science-fiction countdown, every six minutes a theta-pinch plasma device will release about 51 million neutrons produced by the fusion of deuterium nuclei at energies equivalent to 100 million degree Fahrenheit. Guy Suits, head of GE's research laboratories, says that visitors "will be told that, hopefully, fusion will become a practical power source during the lifetime of the youngest child in the audience" - which could mean a decade or a century. GE's other exhibits will include a simulated electric storm on the sun's surface and will have exhibits of lasers, space technology and cryogenics. An electrified model of the human brain in the Upjohn Co. display at the Hall of Science will use 30,000 small flashing lights to show how information is handled in thought processes. 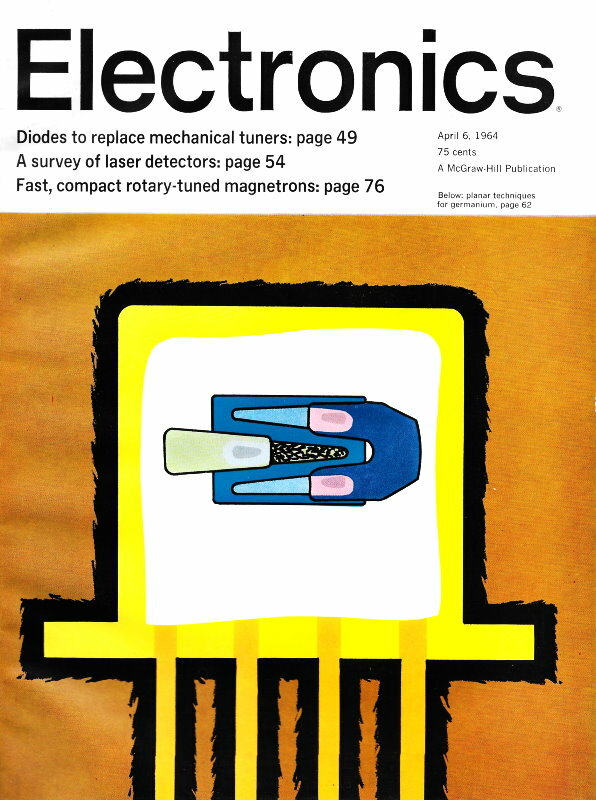 A model collection of modern diagnostic and patient-monitoring equipment, much of it electronic, will be found at the Atomedic Hospital [Electronics, Dec. 27, 1963, p.41]. This is a complete small hospital serving the fairground; it can be visited by appointment only. Its purpose is to show how medical-care costs can be reduced by ussing automation and remote control. Almost every spot at the fair will be in sight of one of 11 electronic communications arches, put up by the General Foods Co. These will provide continuous news coverage and summaries of fair events in large bright-letter displays. 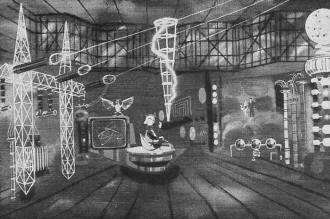 Electronics also will direct the Fountain of the Planets, the largest of eight fountains that punctuate the fairground. The fountain is made up of hundreds of movable jets whose waters change color, height and shape. It will put on shows with background music, topped every evening by $1,000 worth of fireworks. "This time the barkers and shills will not disappoint you. What do you want? Vast forces dormant in nuggets of imprisoned sunlight? Machines that fly, think, transport, fashion and do man's work? Spices, perfumes, ivory, apes and peacocks? Dead Sea scrolls? Images divine and graven? Painted lilies and refined gold? The products of philosophy which is the guide of life, and knowledge, which is power? We shall have them all." The fair is going to get pretty crowded. About 80 million admissions are expected during the two seasons of operation. and nobody would be surprised if half a million people turned up on a sunny summer Sunday. So plan to beat the rush; go on rainy mid-week mornings. 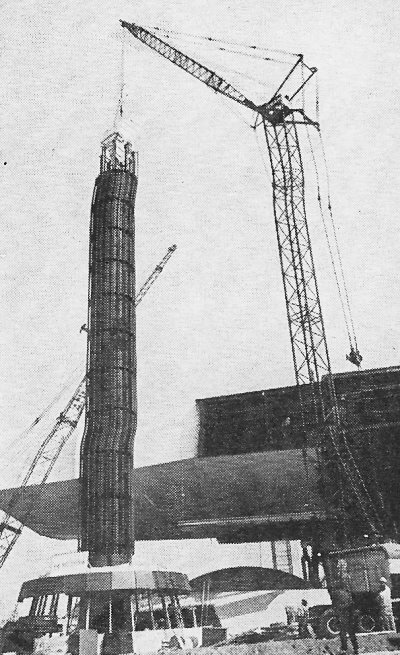 Television link between the fair and Manhattan, a single-horn antenna is being erected on a 130·foot tower next to the floating wing of the Bell System pavilion. The fair will be big. Its 646 acres are divided into five major areas: industrial, international, federal and state, transportation, and the lake amusement area. There are about 150 exhibits. It would take two full weeks of 12·hour days to breeze through them all, not counting transportation and waiting time. Read the literature first, decide what you want to see, plan your itinerary. Specialize. Nation's first public demonstration of nuclear fusion being triggered at the GE pavilion. • Subway, 15 cents from anywhere in New York City. 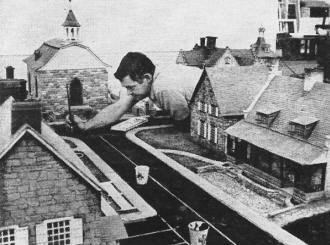 • Long Island Railroad, 50 cents and 12 minutes from Pennsylvania Station. • Boat from Pier 81, or a hydrofoil boat from lower Manhattan. • Helicopter from lower Manhattan or the major airports. Fare is about $8, the trip takes 5 to 10 minutes, and there is a magnificent view and landing on the fair's own heliport-restaurant. More than 75 restaurants will serve any-thing from a hamburger to a three-hour luau. You can leave your children in a supervised playground at one of several pavilions. Although the admission fee is $2 for adults and $1 for children aged 2 to 12, books of tickets and group tours can save you money. And if your busman's holiday of electronic exhibits proves too much, you may want to go to the Simmons Beautyrest pavilion where, for a dollar, you can get a half hour's relaxation on a comfortable mattress.